Beautifully engraved map of the Western Hemisphere. The Western Hemisphere from the Latest Discoveries. 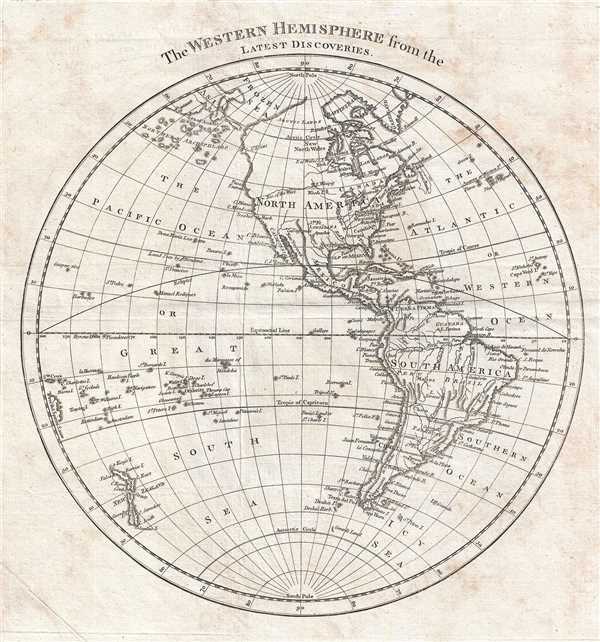 This is a c. 1782 map of the Western Hemisphere by an unknown cartographer. Based on the geography, our best guess is that this map was published in 1782, just prior to the publication of Cook's maps. The entirety of the Western Hemisphere, including North and South America, Greenland, and numerous islands in the South Pacific, as well as New Zealand, the extreme western tip of Siberia, and the Cape Verde and Azores Island, are illustrated. Included are several locations in the United States, including Boston, New York, Long Island, and Philadelphia. It also depicts the fabled 'River of the West' flowing toward the Pacific Ocean from Lake Winnipeg (L. Winipeg). Explorers hoped that this river existed, which would make the journey across the North American continent by river possible. Such a route would be invaluable in transporting goods across the continent and, ultimately, to the rich markets of Asia. Unfortunately, mother nature put several mountain rangers in the way. Other rivers are depicted on the map, including the Mississippi and Amazon. Based on the geography, our best guess is that this map was published in 1782, just prior to the publication of Cook's maps. Very good. Light foxing. Blank on verso.